As a young disabled person with a combination of learning disabilities, depression, anxiety, and a spinal injury, I looked out on my world and saw that it was a place that couldn’t fit me in—there were barriers to access everywhere and disability was seen as a problem, a fundamental lack of belonging rooted in the body. I thought to myself that the only way to envision a world where we could belong was through tales of imagination, a different world, a future world, a world that had changed in some fundamental way. I consumed science fiction and fantasy, trying to find my body in those pages, my reflection in paper and ink. I read works that claimed to be about otherness, about alien bodies, about mutants and cyborgs, but I kept realizing that these other bodies were believed to be more possible to represent than a disabled body. We can feed that kernel of potential with OUR stories, since our world is storied, and most of those stories have been told to write us into one-dimensional characters. We can assert our three-dimensionality, our complexity, through our voices. 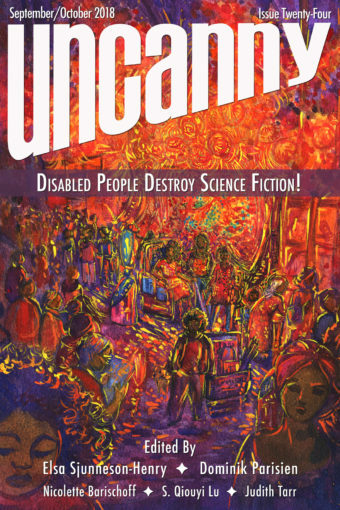 My early desire to see disability and science fiction come together has shaped my work in Disability Studies, which has focused primarily on representations of disability in Canadian SF. My colleagues in Disability Studies frequently ask me why I don’t focus on “something that matters,” like political policy or disability history, and I always find this question interesting. There is a forgetfulness on the part of a lot of Disability Studies scholars of the fact that our imagination SHAPES our policies and we imagine those policies into the world. I focus on imaginative potentials around disability because this is where disability is shaped, forged, and built into existence. Disability is constructed through the gears of our thought processes about the body, through the wires that we connect to our views of normalcy, through the electrodes of our notions of independence. 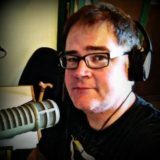 Disability is a machine that we build in our imagination and then send rolling out into the world, changing things as it goes, and yes, one of those things that the disability construction machine churns out is policy, shaped by all of the assumptions, ideas, perceptions, and biases that are fed into it. SF may be seen as something fictional, imaginary, and insubstantial, but it, like the arts in general, has real effects on the world. It is a transformative genre and provides a space for ideological transformation, for the generation of new ideas that break down the idea of social norms. SF in its direction toward the ABnormal becomes a powerful space for challenging hierarchies that push only one way to be“normal” in our society. My hope for science fiction to produce a new paradigm for looking at disability is partially shaped by the revolutionary texts that I have already encountered in science fiction, texts that have influenced new ideas like Mary Shelley’s Frankenstein (which could arguably be an early science fiction text as well as an early commentary on disability with its presentation of a medically manufactured body that becomes a site of stigma and abjection), Ursula K LeGuinn’s Left Hand of Darkness (which critically questioned ideas of normativity and gendered expression), Starhawk’s The Fifth Sacred Thing (which critically questioned the political relationship between power structures, our bodies, and our beliefs), George Orwell’s 1984 (which invited questions about the messages our media portrays to us and the power structures behind it), and, of course, Star Trek (inviting ideas of radical utopianism and suggesting that a non-capitalist system and a social system devoted to the desire to learn could be possible). Science fiction portrayed itself to me as a genre of ideas that had the potential to be unrestricted, yet I noticed that biases subtended these texts, whether produced by the authors, by reactions of the fans, by conservative publishers, and beliefs in the “unrelatable portrayal” that served to make only stories about straight, white, able-bodied cisgender male narratives canonical and perceived as the only “universal” stories. We still have a long way to go, but SF invites us to explore. There are already steps toward these critical questions about disability in science fiction in anthologies like Accessing the Future (gathering together voices of disabled people to create SF tales of disability), The Sum of Us (an anthology complicating ideas of care and caregiving), Alison Sinclair’s Darkborn series (presenting the social changes that would occur in a world where half the population is blind), Tanya Huff’s novel Gate of Darkness, Circle of Light (which features a protagonist with an intellectual disability who resists containment or control), Ada Hoffmann’s short story “You Have To Follow the Rules” (which transports the reader into a world where autism is the norm and asks us to reconsider how we codify rules of social interaction and privilege neurotypicality), and, even though it is horror, Todd Browning’s film Freaks, whose influence has been so powerful that it has meant that the film’s quote “one of us, one of us” has become a rallying call for radical inclusion of diverse bodies as well as a critical reaction to systems around us that portray our disabled bodies as spectacle. These works resist simplification and seek to invite questions rather than seeking to provide an answer. These works are vital first steps toward rethinking disability. Many of us writing about disability are thriving at that vital intersection between critical explorations of images of disability, our own lived experience, and our desire to creatively produce change. We have a space in SF to reclaim something that is important for people with disabilities—imagination. It is possible in SF to imagine otherwise, to think up new possibilities instead of closing them down by saying that they aren’t viable. Disabled people can reclaim our futures in the same way that we do everything in an ableist world—with vulnerability. We can wield our vulnerability as a tool for writing, bringing our readers on a journey into a space vulnerability with us where they can question the ableist apparatus around us.